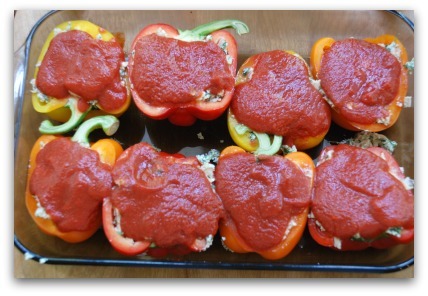 Simple chicken stuffed bell peppers with tomato sauce and cheese. This chicken stuffed bell peppers recipe was a sort of last minute idea. I had been to the grocery store a couple of days before and the rotisserie chicken display advertised "Buy one get the second for 1/2 price". Hello!!! Even though there are only two of us in this household, I can't resist a bargain. So I trotted on home with two cooked chickens. We ate chicken for two days and still had a whole chicken left. I could have taken it apart and frozen the pieces but that always seems to dry out the meat. So I decided to get creative. I took all the meat off the bones and chopped it all into small cubes. I kept the bones to make bone broth of course! I had all the fixin's for making stuffed peppers but what if I stuffed the peppers with chicken instead of ground beef? Of course curiosity always gets the best of me. So here's what I came up with and it's really, really, good! 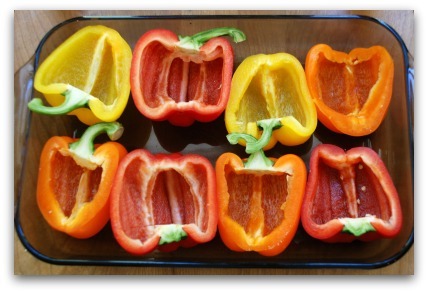 Cut bell peppers in half lengthwise, try to leave the stem intact. Place in two baking dishes large enough to hold the peppers snugly. 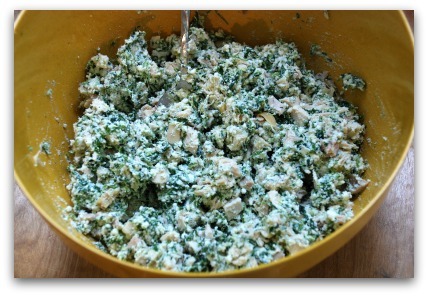 In a large bowl combine the chopped chicken, ricotta, spinach, oregano, basil, garlic and Parmesan cheese. 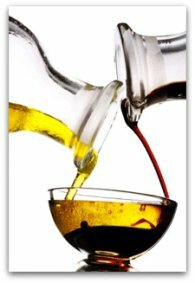 Combine thoroughly. Fill the pepper halves evenly with the chicken mixture, packing them full and flush to the tops. 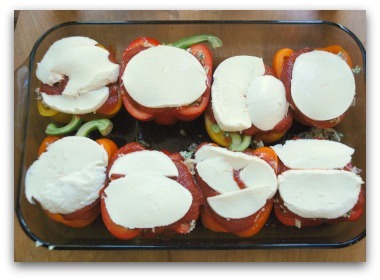 Divide the tomato sauce evenly over the 12 pepper halves and top each one with 1 oz slices of the soft mozzarella. 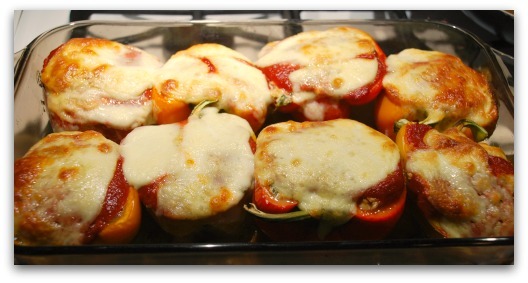 Bake for 45 minutes until the peppers have softened a little and the cheese is golden. If you need to, place under the broiler for a moment but keep an eye out so you don't scorch them. One bell pepper half is surprisingly filling. 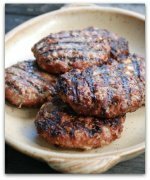 Serve with a simple salad on the side. 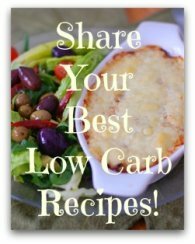 Let's leave this chicken stuffed bell peppers recipe and check out more chicken casseroles.